How do modern Muslims adapt their traditions to engage with today's world? 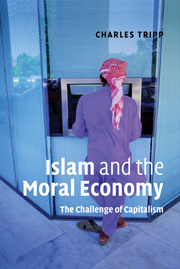 Charles Tripp's erudite and incisive book considers one of the most significant challenges faced by Muslims over the last sixty years: the challenge of capitalism. By reference to the works of noted Muslim scholars, the author shows how, faced by this challenge, these intellectuals devised a range of strategies which have enabled Muslims to remain true to their faith, whilst engaging effectively with a world not of their own making. The work is framed around the development of their ideas on Islamic socialism, economics and the rationale for Islamic banking. While some Muslims have resorted to confrontation or insularity to cope with the challenges of modernity, most have aspired to innovation and ingenuity in the search for compromise and interaction with global capitalism in the twenty-first century. Acknowledgements; Glossary; Introduction; 1. The 'social problem'; 2. Islamic social critics; 3. Islamic socialism; 4. Islamic economics and Islamic banks; 5. Repertoires of resistance: Islamic anti-capitalism; Conclusion; Bibliography; Index.